Since the 2011 Arab Spring, there has been a truly revolutionary spirit floating around North Africa and the Middle East; with many of its inhabitants rising up against their dictators and the old regimes. We also see that this attitude has seeped into the music, with bands like Cairo Liberation Front incorporating this fighting spirit into their music. Although the Dutch duo are Europe raised, you can lucidly hear the Middle Eastern influence in their songs. The two producers, Joep Schmitz and Yannick Verhoeven have been crafting their electro-chaabi sound for years and this has culminated in them putting together their forthcoming EP, Eurabia Vol 1; the follow up to their debut tape on Höga Nord Rekords. Today we bring you one of the gems from their upcoming project, in the shape of 'Tilly'. 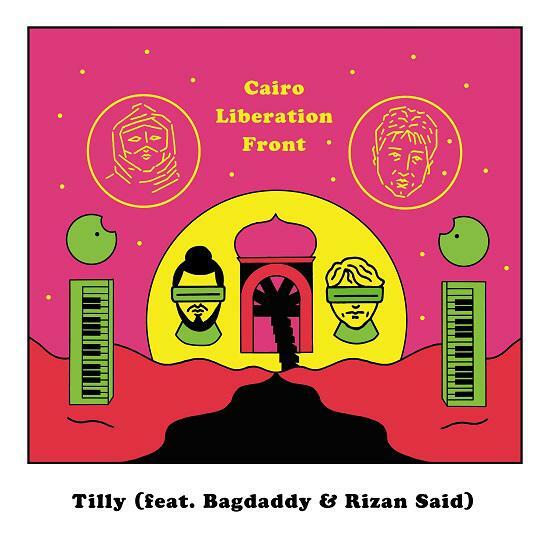 The track sees Cairo Liberation Front collaborate with Syrian musician Rizan Said, whose shrilling keyboard synths combine a punk rock style, with sonics from the shaabi music genre, creating the eclectic gumbo that is electro-chaabi. The group also bring on board Iraqi/Dutch female vocalist Meis (aka Bagdaddy), whose cutting vocals sit atop the intense instrumental, leading the charge for the song and taking it to glory.